There is a mystery surrounding the amount of infrared light that bathes the universe -the so called cosmic infrared background radiation. It's been detected by a number of space based telescopes, but with clusters of higher intensity than could be accounted for by all known galaxies. Now, a paper in the journal Nature suggests that this glow may be coming from orphaned stars - hurled out of their parent galaxies, and now resident in the local Dark Matter Halo. 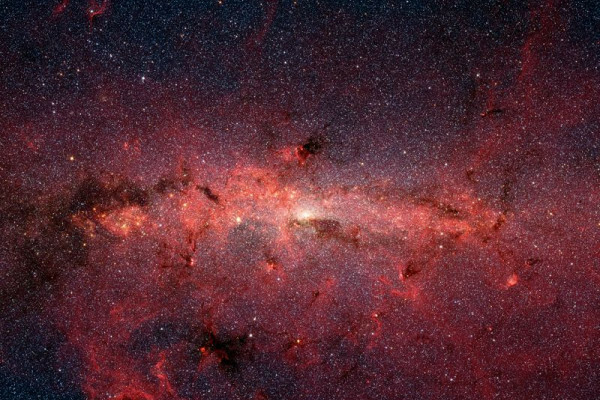 Previous research had suggested that the radiation may have come from faint, distant background sources, too far away to be distinguished by the telescopes, or from intermediate dwarf galaxies. These two hypotheses would result in a different distribution of IR, but previous studies had been too small to analyse the grand structure. With this in mind, Edward Wright of the University of California, Los Angeles and colleagues looked at data from the Spitzer Deep, Wide-Field Survey collected between 2004 and 2008. After correcting for local sources of IR, and masking out radiation from bright stars, they were able to measure the spatial variability over large areas. Although their measurements showed some correlation with the distant-galaxy hypothesis, they found that neither hypothesis was enough to fit their measurements. They now propose that the "extra" IR may be coming from intrahalo stars - stars that have been thrown from their parent galaxies in violent interactions and now reside in the dark matter halo surrounding each galaxy. The authors state a number of future tests that are needed to further understand the contribution of intra-halo stars, and in a related News and Views Article, Andrea Ferrara from the Scuola Normale Superiore in Italy, states that "It will be interesting to see whether the authors' proposal stands up to scrutiny." Ferrara adds that understanding the effect of intra-halo radiation will help us to study early galaxies as they undergo a process of reionisation in the so-called "dark ages" of galaxy formation - a poorly understood chapter in the history of the universe. How can you determine the distance to a star?